Søren Kierkegaard (born as Søren Aabye Kierkegaard in Copenhagen, Denmark, died in Copenhagen, Denmark) was a famous Philosopher from Denmark, who lived between May 5, 1813 and November 11, 1855. He became 42 years old. Søren Aaby Kierkegaard was a Danish theologian, philosopher and psychologist. 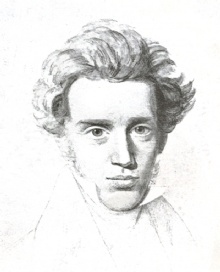 Kierkegaard is often regarded as the greatest Danish philosopher and father of existentialism. After Jean-Paul Sartre and atheistic existentialism Kierkegaard referred to often as the main figure in the Christian existentialism. It is characteristic that the works of authorship first phase is published under pseudonyms, but in the postscript to Kierkegaard acknowledges that all its works. Using pseudonyms, he has been the theological, philosophical and psychological issues play dialectically against each other in a way that has made him one of existentialism fathers. Furthermore, it also means that pseudonyms have just made ​​the understanding of his works were up to the individual to decide, since the argument was not presented by Kierkegaard himself. Concurrent with this work he published a number of religious "talk", which was collected in 1845 under the title Eighteen edifying speeches. They were released under his own name, partly to show that he is primarily regarded himself as a religious and Christian writer. He is born under the zodiac taurus, who is known for Security, Subtle strength, Appreciation, Instruction, Patience. Our collection contains 48 quotes who is written / told by Søren, under the main topics: Dating, Religion. "Not just in commerce but in the world of ideas too our age is putting on a veritable clearance sale. Everything can be had so dirt cheap that one begins to wonder whether in the end anyone will want to make a bid"
"One can advise comfortably from a safe port"
"Old age realizes the dreams of youth: look at Dean Swift; in his youth he built an asylum for the insane, in his old age he was himself an inmate"
"To dare is to lose one's footing momentarily. Not to dare is to lose oneself"
"There are, as is known, insects that die in the moment of fertilization. So it is with all joy: life's highest, most splendid moment of enjoyment is accompanied by death"
"People commonly travel the world over to see rivers and mountains, new stars, garish birds, freak fish, grotesque breeds of human; they fall into an animal stupor that gapes at existence and they think they have seen something"
"It seems essential, in relationships and all tasks, that we concentrate only on what is most significant and important"
"The paradox is really the pathos of intellectual life and just as only great souls are exposed to passions it is only the great thinker who is exposed to what I call paradoxes, which are nothing else than grandiose thoughts in embryo"
"The more a man can forget, the greater the number of metamorphoses which his life can undergo; the more he can remember, the more divine his life becomes"
"The highest and most beautiful things in life are not to be heard about, nor read about, nor seen but, if one will, are to be lived"
"The function of prayer is not to influence God, but rather to change the nature of the one who prays"
"Take away paradox from the thinker and you have a professor"
"Since my earliest childhood a barb of sorrow has lodged in my heart. As long as it stays I am ironic if it is pulled out I shall die"
"Since boredom advances and boredom is the root of all evil, no wonder, then, that the world goes backwards, that evil spreads. This can be traced back to the very beginning of the world. The gods were bored; therefore they created human beings"
"Purity of heart is to will one thing"
"Prayer does not change God, but it changes him who prays"
"Personality is only ripe when a man has made the truth his own"
"Marriage brings one into fatal connection with custom and tradition, and traditions and customs are like the wind and weather, altogether incalculable"
"Love is all, it gives all, and it takes all"
"Listen to the cry of a woman in labor at the hour of giving birth - look at the dying man's struggle at his last extremity, and then tell me whether something that begins and ends thus could be intended for enjoyment"
"Life has its own hidden forces which you can only discover by living"
"Just as in earthly life lovers long for the moment when they are able to breathe forth their love for each other, to let their souls blend in a soft whisper, so the mystic longs for the moment when in prayer he can, as it were, creep into God"
"It was completely fruitless to quarrel with the world, whereas the quarrel with oneself was occasionally fruitful and always, she had to admit, interesting"
"It is so hard to believe because it is so hard to obey"
"It belongs to the imperfection of everything human that man can only attain his desire by passing through its opposite"
"If I am capable of grasping God objectively, I do not believe, but precisely because I cannot do this I must believe"
"I see it all perfectly; there are two possible situations - one can either do this or that. My honest opinion and my friendly advice is this: do it or do not do it - you will regret both"
"I feel as if I were a piece in a game of chess, when my opponent says of it: That piece cannot be moved"
"I begin with the principle that all men are bores. Surely no one will prove himself so great a bore as to contradict me in this"
"How absurd men are! They never use the liberties they have, they demand those they do not have. They have freedom of thought, they demand freedom of speech"
"God creates out of nothing. Wonderful you say. Yes, to be sure, but he does what is still more wonderful: he makes saints out of sinners"
"Far from idleness being the root of all evil, it is rather the only true good"
"Faith is the highest passion in a human being. Many in every generation may not come that far, but none comes further"
"Face the facts of being what you are, for that is what changes what you are"
"During the first period of a man's life the greatest danger is not to take the risk"
"Don't forget to love yourself"
"Concepts, like individuals, have their histories and are just as incapable of withstanding the ravages of time as are individuals. But in and through all this they retain a kind of homesickness for the scenes of their childhood"
"Boredom is the root of all evil - the despairing refusal to be oneself"
"Because of its tremendous solemnity death is the light in which great passions, both good and bad, become transparent, no longer limited by outward appearences"
"Be that self which one truly is"
"At the bottom of enmity between strangers lies indifference"
"A man who as a physical being is always turned toward the outside, thinking that his happiness lies outside him, finally turns inward and discovers that the source is within him"